There is no more diverse natural stone in its types and colors than agate. Mineral agate was so named by Theophrastus, Greek philosopher and naturalist who discovered it at the Achates river. 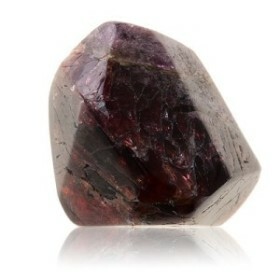 It is believed that the scientist called the found gem in honor of the river. Translated from the Greek “Achates” has the meaning “Lucky”. In ancient Greece agates were called any solid striped stones. Ancient people used extensively agate for making talismans and amulets. There was a belief in some nations that this stone could make its wearer invisible. 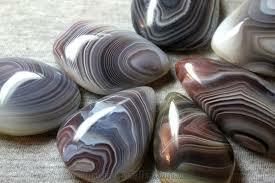 Also, the ancients believed that agate could be found only by a man whose spirit was free from evil thoughts. Jewelries with these stones were found in Sumerian and Egyptian emperors’ tombs. This gem was grind in the form of the human eye and inserted into the statues’ eye sockets for protection from evil forces. Agate earrings are mentioned in the Homer’ “Odyssey”. According to the book one of Penelope’s admirers gives her this jewelry. Blue agate was worshiped by Indians of North America as a talisman of peace and unity. People in ancient Greece and Rome often cut prints and cameos from this mineral. Nobility used to collect such gizmos. Interest in agate cameos revived in the Middle Ages in the era of the Crusades. The Knights went for glory, keeping to himself portrait of a lady of the heart, whose face was carved on the gems. If you believe the witnesses, a master needed as much time for the manufacture of a large agate cameo as he needed for the construction of the cathedral. 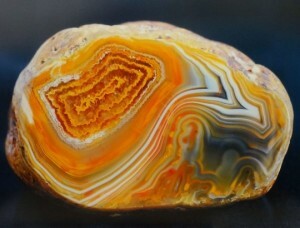 Russia has started to cut agates at the end of the XVII century. First there were made jewelry, snuff boxes and boxes of these stones. A local semi-precious stones and imported raw materials were used for this work. Fashion for agate was changeable in Europe: the stone was forgotten for several decades and regained popularity. Brazilian and Uruguayan agates began to be brought to Europe from the middle of the XIX century. They were of excellent quality and interest in these rocks rose again. At that time, they were widely used in Jewelry Faberge. Due to the richness of deposits in South America, gem prices began to decline and interest in the mineral fell in high society. Currently anyone can afford a decoration with this semi-precious stone. Agate is a variety of chalcedony, a mineral that belongs to cryptocrystalline quartz. A distinguishing characteristic of all varieties of stone is resistance to acids. They are found all over the world, including United States , Myanmar, Uruguay, Brazil, Mexico, Argentina, Botswana, Australia, India and Russia . There are hundreds and even thousands of types of agates. A distinctive feature of the most of these stones is a layered structure and striped coloring. For example, there are stones in which an inch of its width can account for up to seven thousand layers. 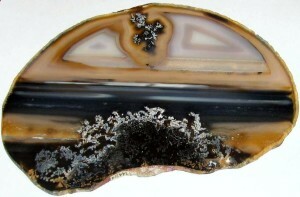 Gray is the most common color in agates. Typically, these rocks are repainted in different colors to become more attractive.To make the uniformity and brightness of color, agate is often tinted. 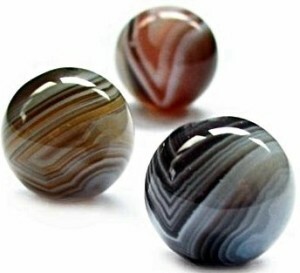 What colour is agate? Natural color of this mineral may include black, white, red, blue, yellow, green, orange, pink, brown, purple and gray. 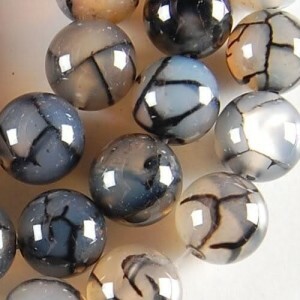 Note that purely black agate does not exist in nature. 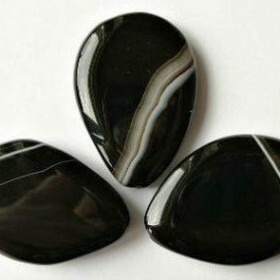 Therefore, the “black” refers to stones that have at least one dark inclusion. Of course, it’s impossible to describe all the varieties of this mineral in one article, but the most popular of them read on. – Sapphirine is a blue stone. – Moss agate is a stone got its name from the place of production of the Moho in Yemen. Typically, these gems are blue-gray color and are characterized by the presence of specific inclusions resembling moss on its drawing. – Landscape agate is a stone having inclusions that form a specific pattern. Drawing on such gems looks as a natural picture. 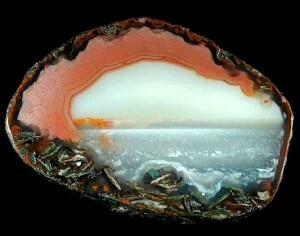 – Brazilian agate is extremely beautiful stone. Its pattern is very thin concentric layers of gray, brown and white colors. Sometimes these agates are tinted. 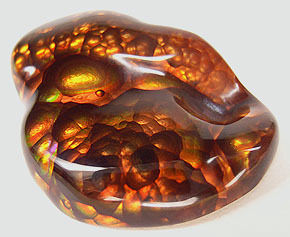 – Fire agate got its name because of the presence of crystals of goethite. Stone looks as if it is on the inside. – Frosted agate is a white or gray stone containing a large amount of opaque inclusions, which give it a resemblance to frosty patterns. – Agate Botswana is an African agate, which is one of the most expensive chalcedony. Natural stone is mostly gray or pink tones with very beautiful layered pattern. The method consists in the fact that gem is susceptible to high temperatures, and after it is quenched. From this stone is covered with a network of small and beautiful cracks. So you get agates with the common name “Crackle”. The crystals can be tinted prior to heat treatment as well as after it. 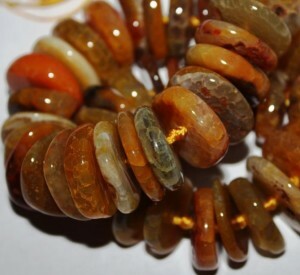 In the first case, the resulting cracks are lighter than the crystal – is “African agate”, or if it is toned in orange or red color, it is also sold under the guise of “fire agate”. If a stone is painted after it is cracked, the streaks will be darker than the base color. 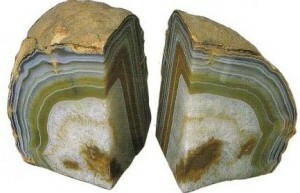 Such agates are called “dragon veins”. Often these gems are further processed by special trains to become mat. Crackled agates, of course, are beautiful, but it is unlikely to ascribe to them any special magical properties that are different from other chalcedony.We should also mention the variety of semi-precious stone, sold under the name “dragon vein”, “african agate” or “crackle agate”. At its core, this is not so much the variety of agate as a method for its processing. Talismans and amulets are made ​​of agate from ancient times. This stone is believed increases self-confidence, courage, strength. It strengthens the owner’s vitality and health and keeps him in the physical and emotional equilibrium. 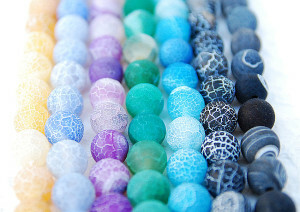 Semi-precious stone is also worn to avoid bad dreams and bring joyful dreams. According to an old superstition, wearing agate gave a man the power to defeat enemies and acquire wealth. In addition, this gem helped a man in making important decisions. Agate enhances creativity and strengthens the intellect, making it profitable mascot for students and artists. It is also known as a lucky and eloquence stone. This gem is a symbol of harmony. One of its main magical destinies is to promote energy balance of yin and yang, that is, male and female. Crystal can purify and stabilize the aura by removing or transforming negative energy. Agate is a very good protective talisman. It is especially suitable for children’s amulets. White stones are extremely useful in this regard. It is believed that if one such gem hanging on a baby’s arm – he quickly learns to walk. They were also used to protect children from falling. Persian magicians used agate to quell the storm. 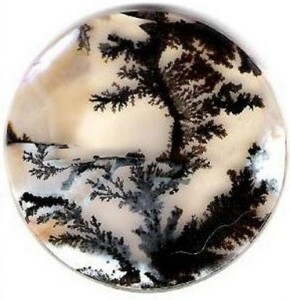 Moss African agate was used as a protective talisman from the intrigues and machinations of enemies. It was believed that it helped to expose the conspiracy and save the owner from evil people. Agate belongs to the healing crystals. It is used to treat indigestion, insomnia, fever. Water, infused with agate, was used in ancient times for making drinking and eating. It was believed that this would help prevent diseases. It is best to use natural agate saturated colors for therapeutic purposes. Placed on the solar plexus, this gemstone can calm stomach pain. In ancient times agate was considered a talisman of poisons. Moreover, it was not only about poisons, but also about the “viperous” people who were able to poison a man’s life. The ability to elicit sympathy for the giver at the one who was given to this stone also refers to the magical properties of agate. Each type of the stone has its own healing properties. 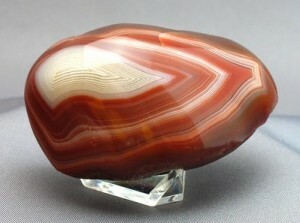 Brazilian agate, worn on the chest, protects against lung diseases. Being in a ring on the ring finger of the left hand is for treatment of heart, and on the middle finger of the right hand – helps get rid of nervous disorders. Sapphirine is good for sore throat and vocal apparatus. It is recommended to wear smokers to clean the lungs of tar. Moss agate was attributed properties to cure diseases of the lymphatic system and to heal from chronic ailments. Agate is a stone of those who were born in May – September. Agate on a horoscope is for the zodiac signs such as Aries, Taurus, Leo, Virgo, Capricorn, Gemini and Cancer. Aries should wear this stone only if he is in a depressed mood. This mineral helps Taurus and Gemini cope with the negative traits. 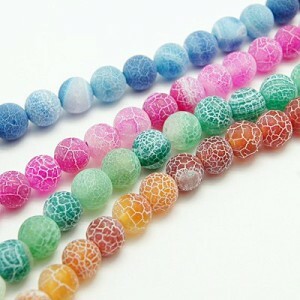 In addition, wearing agate can improve the financial position of these signs. 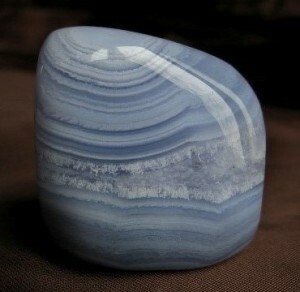 Blue agate, according to a horoscope, will be a good amulet for Virgo and Aquarius. Agate helps Cancer gain confidence, to protect against stress and troubles and develop creative abilities. 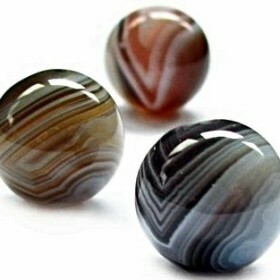 Leo should choose striped agate. In this case, the representatives of the sign can attract success in all endeavors, both in their personal life as well as in career. Blue agate adds vitality and confidence to those born under the sign of Sagittarius.